Today The Guardian Books podcast examines Dracula’s literary legacy. To mark the centenary of Bram Stoker’s death, The Guardian attended the Bram Stoker Centenary Symposium at Keats House in London’s Hampstead. On the podcast Stoker’s great-grandnephew Dacre Stoker and the scholar Elizabeth Miller introduced their new book based on the discovery of a set of journals written by Stoker in his early years. Christopher Frayling explains why he regrets vampires becoming mainstream, and writers Kevin Jackson and Marcus Sedgewick exchange little-known vampire facts. They pay a visit to the columbarium at Golders Green Crematorium where Stoker’s ashes are kept. 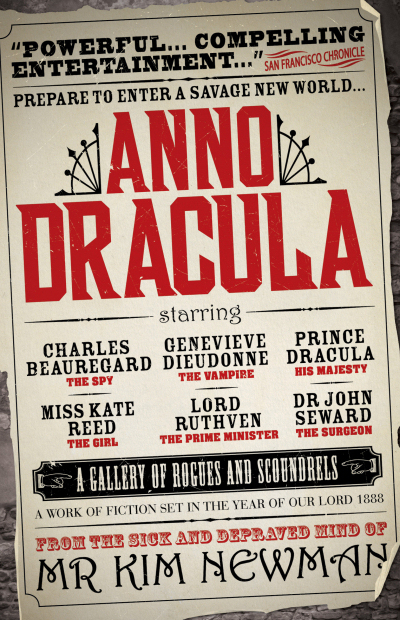 Plus Kim discusses the reissue of his cult series Anno Dracula. I am so late to the party on this one, so, if my question is dated and superfluous, by all means, forgive and forget, please. Has Mr Newman written or spoken about Elizabeth Miller’s take on the relationship between the Count and Vlad? I love his Anno Dracula books (who doesn’t?) and I assume he has an opinion on the matter, especially given that his fiction has made so much of the identity between vampire and Vlad.